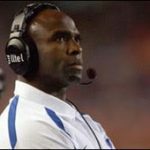 Florida Gators defensive coordinator Charlie Strong has been named as the leading candidate to become the next head coach of the Louisville Cardinals, and University of Louisville athletic director Tom Jurich has been quite open about that fact. While Jurich has not contacted Strong yet and will not do so until after the 2009 SEC Championship game, he has answered questions about his desire to see Strong as his next coach. “I want to get the program rolling, I want to get after it, but I gave my word to several people that I didn’t want to be a disruption to their program,” Jurich told the Courier-Journal on Wednesday. “A lot of guys are still playing for a lot of important things. I’m the last person I want to get in the way.” The Orlando Sentinel spoke with Jurich Thursday and received a similar response. “I have too much respect for Urban [Meyer] and Jeremy [Foley] to be a distraction,” he said. The Sentinel also reports that Jurich will not travel to Atlanta, GA, for the game and, contrary to other reports, is not expected to meet with Strong until after the weekend is over. 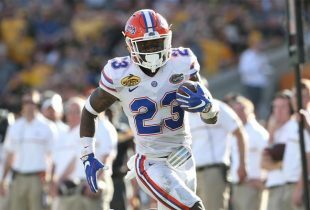 In fact, Jurich and Louisville are of the belief that Florida will make a lucrative counter offer to keep Strong as its defensive coordinator. 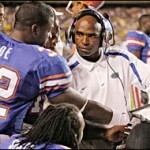 Should Strong leave, it will be the second time in as many seasons that the Gators have lost a coordinator after the SEC Championship game with former offensive coordinator Dan Mullen being hired as the Mississippi State Bulldogs head coach in 2008. 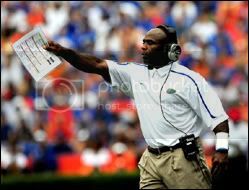 Like Mullen, Strong would likely stay on to coach the Gators in their January bowl game. Assistant defensive coordinator/safeties coach Chuck Heater and assistant head coach/defensive line coach Dan McCarney would be the leading candidates to replace Strong should he accept the job. One of the two could join Strong as his defensive coordinator wherever he winds up.